Here is a quick card I whipped up for a friend. 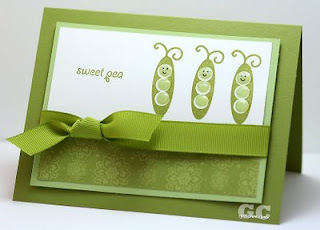 I just love these little pea pod's from the Green Thumb set by Papertrey Ink. I added some eyes and a smile with a black fine tip pen, which I think makes them so cute! It is hard to see from the photo, but I added some Crystal Effects to the peas, which makes them look pretty real. This card is just the sweetest! I love those little peas.